The Portrait of a Soldier exhibit is a traveling display of hand-sketched portraits of fallen servicemembers from Illinois who have been killed since September 11, 2001 in the Global War on Terror. 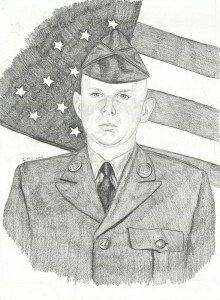 Artist Cameron Schilling, of Mattoon, drew the first portrait in August 2004, after Army SPC Charles Neeley, also of Mattoon, was killed in Iraq. Schilling gave the sketch to SPC Neeley’s parents to convey his sympathy for their loss. In October 2005, while a student at Eastern Illinois University, Schilling decided to draw a portrait of every Illinois servicemember who has fallen during the Global War on Terror. The portraits are copies of the original, which has been given to the fallen soldiers next of kin, and the exhibit travels throughout the state of Illinois. On many occasions, Governor Pat Quinn holds a press conference on the opening day and invites families of the fallen soldiers who live in the area to attend. Click to View More Information at the Operation Homefront Website. Lt. Governor Pat Quinn unveils the Portrait of a Soldier memorial – a riveting display of portraits of Illinois soldiers killed in the Global War on Terror. Quinn was joined by the artist, 22-year old Cameron Schilling of Mattoon, Illinois who is a student at Eastern Illinois University.